Interview Question: What Would Be Your Ideal Company Culture? Before you start to formulate an answer for an interview question about the company culture you would be most interested in working in, take the time to brainstorm about company culture as a whole, and what it means to you. This is an important question both for you and for your prospective employer. 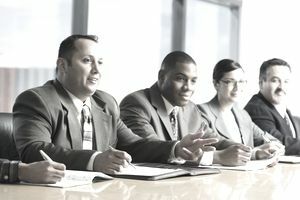 Are employees at all levels involved in decision making? Does the organization have a coherent mission and strategic plan, and are they clearly communicated to staff? Are teamwork and collaboration valued? Are employees rewarded based on merit or does political favoritism play a more important role? Does the organization encourage innovation and entrepreneurship? Is there a pattern of promotion from within? Does the company make a major investment in training and professional development? Are leaders and veteran staff encouraged to mentor? Is there an element of fun for employees who work there? Are employees afforded the flexibility to accommodate outside needs and interests? Write down your answers to the above questions. Now that you have these aspects in mind, you can prepare for this question by breaking down the process into three parts. Create a profile of your ideal organizational culture. What exactly is it you’re looking for in company culture? Research the culture of your target employer. Go to their website. The "About Us" and Career sections of should provide some clues as to what the culture is like. Also, check their social media pages. You can even gain insight into questions about company culture right before your interview. Ask the staff who you meet early in the interview process to characterize the organization’s culture for you. to generate a list of sites with feedback from current or past employees about the organization. Do they get good reviews? What do they say about workplace conditions and culture? One of the best ways to get an unbiased insider's view of corporate culture is to network with current or past employees. Perhaps you know an employee who works for the company or knows someone who knows someone else who works there. Search LinkedIn to see if you have any contacts at the organization or if your primary contacts are connected to any employees and ask them to describe the culture. Once you have a sense of the company's culture, decide which parts of your ideal profile to incorporate in your answer. Although you’ll want to carefully evaluate how the culture at your target organization matches your criteria to make a sound decision about the job, it’s usually not strategically advantageous to share your entire list of preferences. Some of these criteria can be kept to yourself. Instead, focus on areas where your preferences overlap with aspects of the company’s actual culture. After all, no corporate culture will exactly line up with your criteria. So, if an organization values innovation, you might emphasize your interest in an organization that supports staff initiative. Also, place greater emphasis on factors which can reveal how you will add value, as opposed to aspects of the culture that will satisfy your personal needs. You might focus less on elements like fun and flexibility, than on factors like opportunities for training and professional development, or rewards for high levels of performance. Is This the Right Company Culture For You? It’s important to carefully evaluate the company’s culture to determine whether it’s a fit for you. If the information you discover while you’re researching makes you think you might not want to work there, there’s no point in trying to convince the employer that you would be a good match for the job. Consider whether this is the right position for you before you move forward with the application process. If you decide it’s a go, then it’s time to prepare for your interview. The interviewer will ask more questions to see how you might fit into the company culture and to determine if you’re a good fit. Review this guide on company culture interview questions so you can prepare the best answers. In addition, the interviewer will also ask specific questions about you. Tips for Answering Would You Rather Be Liked or Respected?